Is your roof reaching the end of its expected lifespan? Has it been damaged to the point where repairs are not a cost-efficient option? If either is the case, you’re going to want to consider having your roof replaced. There are many types of roofs that you can have installed; however, when considering Miami’s unique climate, we highly recommend metal roofing. Not only is metal roofing is easy to maintain, it’s incredibly energy efficient as well. Is Metal Roofing Easy to Maintain? Metal roofing tends to be much less vulnerable to the elements than other types of roofing, such as wood or asphalt shingles. This, in turn, makes a metal roof much easier to maintain. There are several reasons for this. First of all, metal roofs are less likely to experience leaks. This is due to their hard and slippery surfaces as well as the way that metal roof panels interlock, which allows rain to easily slide off. Metal roofing is also resistant to fire, mildew, rot, and insects, all of which commonly cause damage to other roofing materials. If you have a metal roof installed, then as long as you schedule a regular inspection to ensure that it remains in good condition, you can expect your metal roof to last for as many as 20 to 50 years. There aren’t many other roofing materials that are as energy efficient as metal roofing. This will come in handy during the summers here in Miami when you’re going to want to keep as much heat out of your home as possible. A metal roof will reflect heat, preventing it from penetrating your home. This will allow your air conditioning system to work much more efficiently since it won’t have to constantly fight rising temperatures in your home. As a result, your cooling bills are going to be lower, especially during the summers, if you have a metal roof installed. In fact, a metal roof can provide upwards of 50 percent in energy savings. If you need to replace the roof on your Miami, FL, area home, then you should seriously consider metal roofing. Not only are metal roofs easier to maintain, they’re incredibly energy efficient as well. If you’re interested in a metal roof replacement, then be sure to contact us at A-1 Property Services to request a free quote today. Metal roofing is an excellent option in Miami for residential homeowners due to their ease of maintenance as well as their energy efficiency. But those aren’t the only two factors that you should consider when getting a roof replacement. You’ll want to make sure that you have a durable roof installed that will withstand the annual hurricane season in Miami, FL. Metal roofs are becoming more popular amongst homeowners in general due to how long they last. 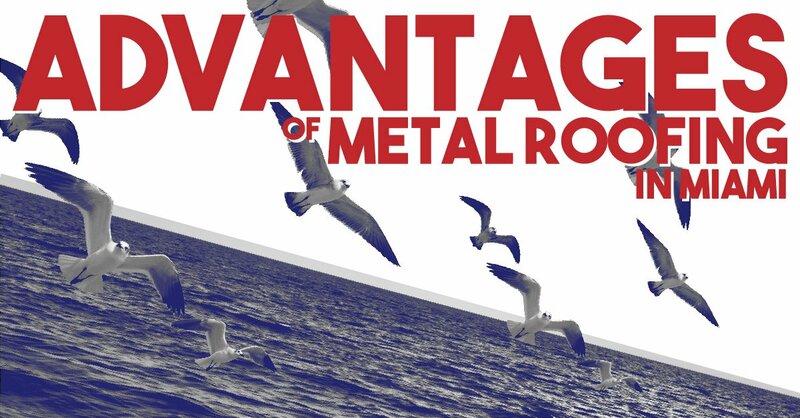 Most metal roof warranties will last between 20 and 50 years, so you can expect your metal roof to last at least this long — although it’s not uncommon for metal roofs to last even longer. The reason why metal roofs last this long is because of their incredible durability. Few other roofing materials are as durable as metal roofs. One of the drawbacks of other roofing materials, especially asphalt or wood shingles, is that they are easily torn off the roof as a result of high-speed winds, something you can expect your roof to have to deal with once hurricane season comes around. A metal roof that has been properly installed will have no problem withstanding winds of up to 140 mph. This means that they will typically withstand hurricane winds. In order for a tropical storm to be classified as a hurricane, it needs to have sustained wind speeds of 74 mph. This is known as a Category 1. It’s only when a hurricane becomes a Category 5, which is the worst type of hurricane, that wind speeds will exceed 156 mph. Either way, metal roofs be less likely to experience damage than other types of roofs, which can not only lose shingles even if wind speeds are only at around 70 mph, but can experience complete tear off. In addition to dealing with hurricane powered winds every year, you’ll also need a roof that can withstand exposure to lots of rainfall. It rains roughly 59 inches a year in Miami, which is well above the national average of 39 inches. A metal roof is durable enough to withstand any potential leaking as long as it’s properly installed. When replacing your roof in Miami, you’ll want something that can withstand the weather, including the heavy rainfall and the annual hurricane season. Metal roofing will do just that. For a free quote, contact us at A-1 Property Services.